Mizuma Art Gallery is pleased to announce “Inochimaru”, YAMAGUCHI Akira’s first solo exhibition in 4 years at the gallery from October 27, 2010. 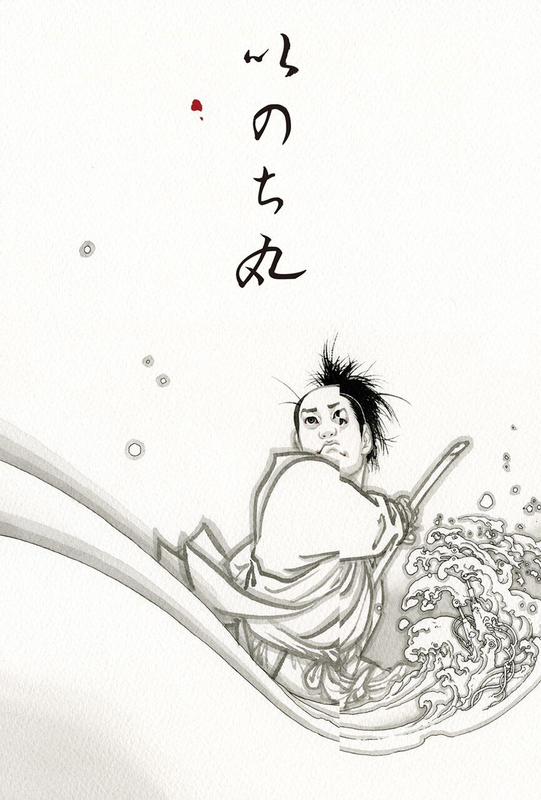 In the exhibition, the story of young wandering Inochimaru unfolds in a series of black and white hakubyo-ga*. The tale begins with the encounter between Inochimaru and a girl who travels exhibiting publicly her beautiful face horribly disfigured. But the storyline goes astray right from the start, following Yamaguchi’s interests, and results in works lining up unconnected, not even a mere enumeration. In the same state of mind, the artist experiments various techniques, ranging from sumi (Japanese ink), pencil, pen and oil paint to light and shadow, even viewers’ retinas, that he takes to unforeseen ends in the shapes of two- and three-dimensional works. The viewers, by catching glimpses of the storyline in the color-freed icons, are at times attracted only to be released next, prompted to awaken to the overall vision of the story. The selection of works prepared by Yamaguchi includes pieces entitled “Edo Rocket”, “House of the Confucian”, “Drawing with No Drawing”, “Dark Matter”, “Great Explosion of Mt Fuji”, all awaiting for your appreciation. How do works, seemingly unrelated, connect and digress from each other inside the exhibition space? We invite you to experience these works, the multiplicity of existences. *Japanese ink drawing solely composed of brush lines.